This variety has proven to be my favorite. It grows very well here, and sends off tons of side shoots once the main stalk is harvested. It keeps on giving! The Italian flat variety has been outside all winter, doing great! After reading the seed packets, I missed an opportunity to grow the Rosette all winter outside, as it’s hardy to 15°F. Oh well, I hope my wok forgives me. This is a new one for my garden. I hear it’s hard to grow, but let’s see what happens. 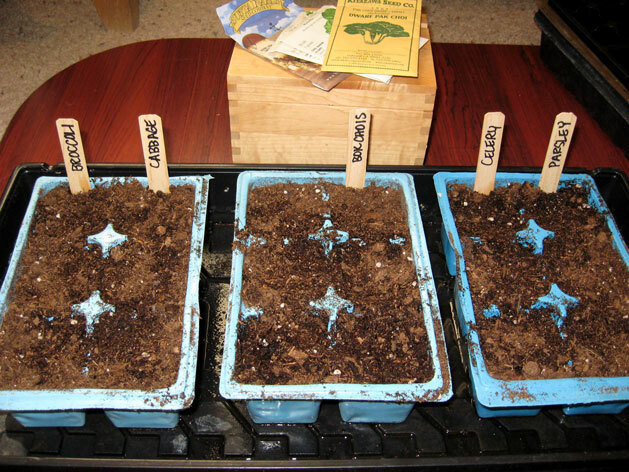 When planting these seeds, I used Whitney Farms seed starting mix in recycled plastic 6 packs that were soaked in a bleach solution and air dried, to make sure they weren’t harboring any possible diseases from last year. I should thank Emily over at www.mysquarefootgarden.net as I purchased her Planting by Color e-book a few years ago. The book is a great guide in deciding what seeds to start at what times. Using her system, my color is Blue, with a last frost date at the end of May. Tell her I sent you! Why haven’t I grown these before? I LOVE jalapeños! I use these often in stir fries, and they dry well for year round use. Also a new addition to this year’s garden. Yum! This is a white pumpkin, that’s as cute at Halloween as it is good to eat. Wish me luck on the cucumbers, as I’m not sure what to do differently with those. They grow about 2″ tall, and then fall over and die. The first year I grew these with some success, but only after putting them under shade cloth until they got a head start. This is in direct opposition to what everyone says, that cucumbers LOVE heat, but we’ll try again this year. I’ve also had some real trouble growing beans. Like the cucumbers, they grow about 2″ tall, and then fall over and die. People have suggested I over watered the beans, but cutting back didn’t solve the issue. I’m trying again with this new variety that does well on a local farm, and will likely buy some inoculant when planting the beans. I’m also thinking birds might be the culprit, so bird netting may be used this year.